Well, how are the dice making projects coming along? Once again it is well overdue for me to post. Exciting news (I hope) is that I am working on two books at the moment: one an edit/rewrite of The Corsers' Hinge to (again, I hope) be released as a stand alone novella, complete with maps, illustrations, a brief explicarium and other appendical (not a real word) matter. Do people want to see this? If it happens it is more likely to come out first. The second is a proper novel that the more I work on it, the more I feel might stretch out into the usual fat, multi-volume "epic" (for want of a better word) I found myself stumbling into with MBT. It will not (as I might have said before... or was that just in a dream...?) be about Rossamünd and Europe this time around, but I hope you are going to really like the new fellow in the spot light (as it were) - he really takes up where dear little Rosey left off. This is all what I would like but it is yet to be accepted/approved/green lit/let come into exiatence so prayers/good wishes/positive quantum flow all appreciated. This does not mean I have abandoned the Branden Rose or her little man, just that I am trying out the Half-Continent from a different point of view. This is actually a significant element of the overall thesis of the Half-Continent: that it came well before I had any concept of specific characters and contains stories from many different points of view yet they are all interconnected - not so much sequel spin-offs but distinct folk who overlap in what I hope are conceivably realistic ways. For example, the protagonist for this new tale plays a very tiny role in Factotum, just as a teaser. As for Duchess-in-Waiting of Naimes and Rosey-me-lad, well, Lord willing we shall see where they are at again in the future. 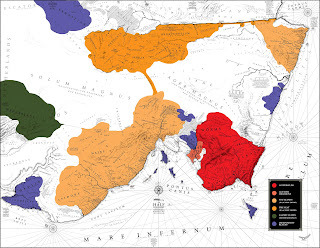 And in answer to you request, Master Come Lately, here be a map showing the rough political boundaries of the Sundergird. Such things are necessarily vague in a land without satellite imaging/modern political wrangling and all such modern/our-world stuff that makes out own maps so punctiliously delineated. I hope you like, and more importantly it helps you-all over there at the Forum. The tabs, Madam Blackwood, are those Post-It [TM] tabs you buy at your local stationer, and I have used different colours depending which book I writing (yellow-green = Foundling, pink = Lamplighter, sky blue = Factotum, dark blue = navy/newest stories... its getting vague, be good to clarify to myself once more) marking a large number of my notebooks in this way at all the pertinent entries for each story as I find them: I sit on my couch and trawl a notebook for anything I might need to know for that current tale, typically scribbling on the tab what the entry it flags is about. Ahh, Master Alyosha, as always you make my day(s): Pococo is actually Italian for "freckles" - I use Italian/Spanish for localised colloquialism of Tutin which one can especially encounter in such areas like western Seat, Tuscanin and across to Catalain. Hello, hello Troubadour! Wonderful to hear about you project - apologies for the lack of a more full depiction of troubardiers. Perhaps Appendix 2 of Factotum gives some idea, just add the sash as shown in Appendix 3 Factotum around the back. And now I am going to be a drag/punctilious pain-in-the-rear and offer that the proper spelling is troubardier - the concept being that they are soldiers (the "~ier" bit) who wear proofing/armour (the "~bard~" bit) that is fully protecting (the "trou~" or "true" bit) *please don't punch me* Will you be showing us you wondrous work when it is done? Can it be seen in its incomplete state at all? If need more keep asking. An art book, huh, Emily Odenwald? Well, I reckon this will be worth doing once I have a bit more "art" under me belt. MBT is just one story and I hope I have a few more in me to tell on the Half-Continent yet, a body of work from which a selection of "art" (appendices, illustrations, maps etc) would be selected. As for manga/graphic novel - sweet! If I was to do such a thing, to stave off boredom I think I would tell an entirely new story. And yes, dear dear Portals old blog-friend, until the conquest by the Tutelarchs and then re-conquest by their descendants/heirs the Tutins, the Soutlands were a collection of independent city-states warring and combining as political need moved. The Germanic names shows the influence of crossing cultures, of Gottish people coming over the Pontus Canis to dwell in the Soutlands. Well, a long blog makes up for a long pause.